Real life is rather busy at the moment, so these four took a little longer to finish than I had hoped. But I like the way that they turned out all the same. The orc stands out a little here. Im planning to expand the Shonen Knives force beyond the initial goal of a Frostgrave warband, aiming for something that will also be sufficently large to field in games of Dragon Rampant. The larger force will be more diverse than a pseudo historical force from feudal Japan. 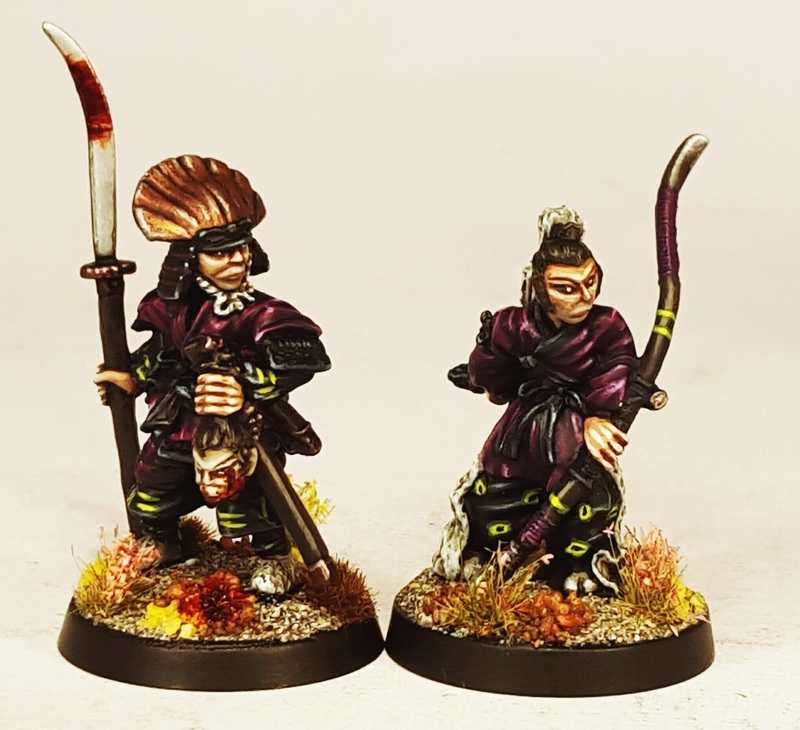 With all sorts of fantasy miniatures available that feature an Oriental aesthetic, I see no reason to limit myself to humans. This scale armoured orc (an old Marauder miniature) is the first of those additions to be painted. 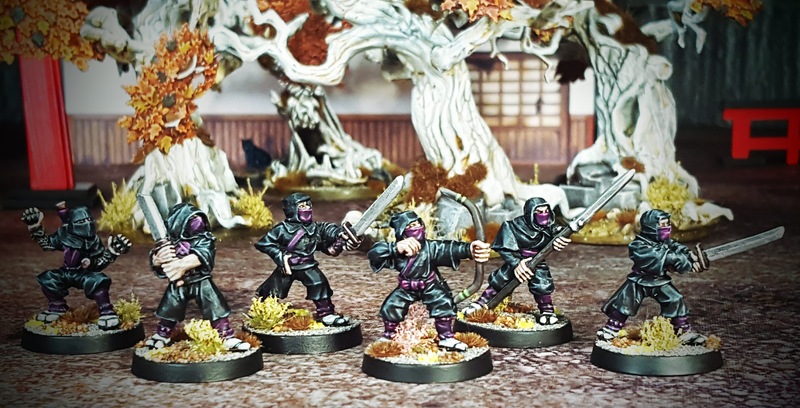 Now that there are six ninja, techncally my first Dragon Rampant unit is complete (Scouts I reckon). Thats a satisfying sub-goal achieved. I havent decided on the roster for my Frostgrave warband yet. For now I am content to pick miniatures from the pile of suitable figures and assign roles to them later. 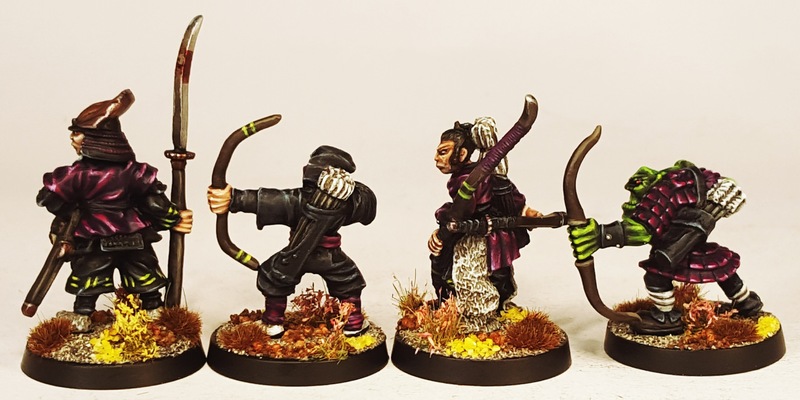 As I had not yet included any models armed with ranged weapons yet, I decided to focus on bows for this batch. The reason that the armoured gent on the left above was chosen for this batch was the severed head that he is carrying. A friend mentioned a couple of times that he reckoned that red would work with the existing palette. Rather than experiment on the armour of a model, I decided to paint a figure that gave an opportunity for adding gore. I can see how I feel about that before I decide to commit to more red. Plus its a pretty badass looking figure anyway. More Shonen Knives next time. Maybe human, maybe not. Some really delicate work there squire. I think the difficulty with adding blood to a figure is generally a matter of composition, too much looks ridiculous, while not enough is simply pointless. Well done on getting the balance right. Thanks for the kind words Mr Kinch. I have been guilty of adding too much gore in the past, although if Im honest, its often a struggle not to lat it on. It had to be surgical(ish) in this case though. He did turn out nicely. The archers trousers are my favourite element I think, although I am getting a lot of pleasure from the way that the scheme is working out. Excellent work; the orc really sets off the group nicely. And, if you plan to expand into more non-humans later, the old citadel orc range had many models with a pseudo-oriental flavour. Much potential there! To be honest showing the images that size feels like a mistake to me. Its much larger and less forgiving than seeing the miniature in hand. But I’m experimenting. Some magnification is always good, but yes I have been horrified by some of my efforts which I had, prior to seeing them billboard-sized, thought rather good…. I reckon that I will find a happy medium. I have approximately fifteen of those Marauder orcs. They feature scale armour and pseudo Mongolian fur trimmed helmets. Units in Dragon Rampant are in multiples of six, so that number that I have should cover my orc requirements. Essentially the orcs will be their own contingent in the final force, rather than mixed in willy-nilly. Thanks for the feedback Warburton! All four have come up very well, particularly the Samurai. I’m surprised at how well the Orc fits in. I enjoy mixing models from different sources and uniting them with a colour scheme: its sometimes surprising what will tie together with that treatment. 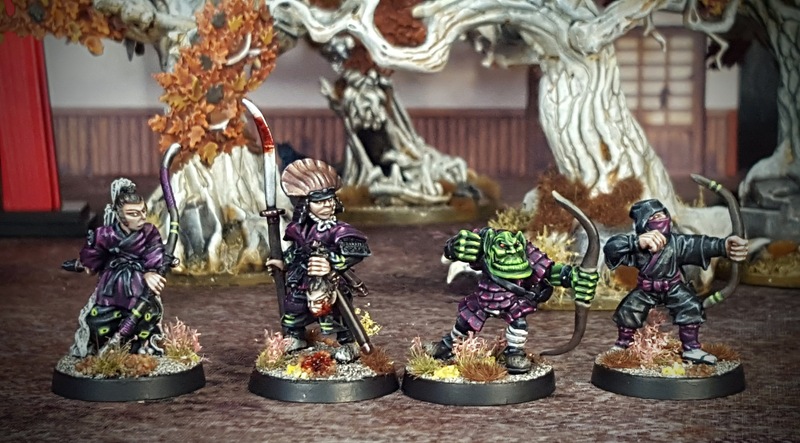 That said, those particular Marauder orcs have a distinctly Oriental theme running through them, so I figured that I could get them to fit. Long term the orcs will be a distinct contingent, rather than shoulder to shoulder with samurai or ninja. Thanks for the feedback Azazel! Very nicely done. I do like those archer pants as well. If you look up hakama online you will see a few options on existing patterns that will replicate very easily even if the pants lack the details. Keep up the great work. Finding the right level of intricacy for the pattern is the trick. It needs to suggest complexity, rather than be complex, as painting it becomes too labour intensive otherwise. I really like your highlighting work on these models. I’m not much of a blender, layering is more my thing. I have found purple to be difficult to paint since I started way back in the eighties. I chose purple for this project partly to force me to up my game. Your painting as always Paul is top class & not no matter what new things you try out you pull off so well done there mate, as for the orc been in there well I come to expect nothing less lol. The orc looks a bit incongruous right now, but as the project comes together he will fit in better. That mode is the first of several planned additions to the Shonen Knives that are categorically Fantasy, rather than pseudo-historical (although I have plenty of those planned too). Thanks for the ongoing encouragement Frank! They are beautiful, (if such a word can be used to describe an Orc and a man clutching a severed head!). I love that lime green you used on the trousers, and I love this project… bravo! The green in this project is one of those colour recipes that I come back to over and over. I enjoy painting it. Lovely work as always, Paul! The bright purple and bright green work wonders together. Good job pulling off the blood on the mini as well, it’s easy to go overboard. Now it looks suitably gross but not too much. There will be very few models that feature any bloodstains or gore in the army Mikko, just a handful. It really is easy to get carried away ( I find that with most painting “effects” – weathering, chipping, OSL and gore) but a severed head demanded a bit I think 🙂 It was fun as an experiment. Im pleased with how well the purple and green are working together. Its a relatively uncommon combo, but it works nicely when it is put together in certain ways. The Joker is an influence, as are a lot of G1 Transformers, in particular the Constructicons. I feel like repeating myself, but hey, your painting is as always superb and I love the Ork! He looks so cheeky. I really like the close ups as it allows an analysis of your brush work which I find very helpful. I would not worry too much about it showing “too much”. Seeing all the texture, highlights and shadows you placed clearly makes it easier to understand how they look so awesome, which in turn is quite motivating. Thanks for the encouragement daggerandbrush. I’ll see how I feel about the larger images as I proceed. That’s at least two votes “for” anyway!